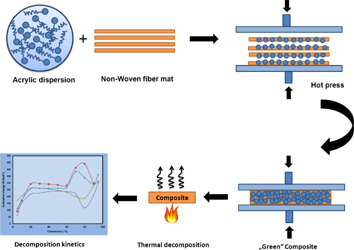 The thermal decomposition kinetics of natural fiber reinforced composites made of flax and hemp fibers were studied using the model free kinetic method. An eco-friendly acrylic ester was used as resin matrix for the fiber reinforced composites at two different contents, 15 and 30%, respectively. The thermal decomposition was investigated using dynamic thermo-gravimetric analysis and the Vyazovkin’s model free kinetic method was utilized to predict the activation energies from the non-isothermal data. The activation energy regime showed a gradual increase up to 20% of thermal decomposition followed by a slight decrease until 60% of the decomposition for all composites investigated. The decrease in activation energy can be explained by the decomposition of the cellulose in the fibers and the ester in the acrylic binder. Above 60% of thermal decomposition a huge fluctuation in the activation energies was observed due to multi-step reactions.